In Part II we are going to discuss mechanisms the therapist may use to trigger the Placebo Effect (PE) to enhance clinical effects of massage therapy and avoid activization or diminishing the negative impact of Nocebo Effect (NE). Of course, this is an introductory article. After publication of Part I we noticed in discussions in different forums that the main topic of the article was sometimes misunderstood by readers. They got the wrong impression that Part I explained the entire massage therapy as a PE. That was a very unfortunate reading of the material. Yes, modern medicine sees the PE as a real and clinically effective self-regulatory mechanism within the CNS. However, the PE and its activation are not a substitute for real therapy in forms of various clinical modalities therapists use to help patients with soft tissue rehabilitation. There is no way the PE can compete with massage therapy in clinical effectiveness. However, PE activation should be used by therapists as an additional tool to speed up the patient’s recovery and make results more stable. Thus, every Medical Massage therapist should use the healing power of the PE as the first step in rehabilitation and add clinically sound massage methods and techniques to address the actual pathology. In such case the therapist combines clinical benefits of massage therapy with activation of self-regulatory mechanisms inside brain itself. We strongly believe that in cases of somatic rehabilitation using massage therapy two fundamental components equally contribute to PE: the therapist’s interaction with the client/patient, personal bioelectrical energy of the therapist and of the patient. Thus, to trigger PE therapists should consider the importance and ways to optimize usage of each component. According to the Gate-Control Theory of pain, any kind of nociception (i.e., unpleasant sensation as pain, numbness, burning etc.) can be blocked on the level of the spinal cord by the Central Control Trigger (CCT), if it was activated before nociception was introduced to the spinal cord. According to Professors R. Melzack and P. Wall (1965), the CCT is the common name of descending nervous pathways which start at the thalamus, which is the brain’s major relay station, continues through posterior columns of the entire spinal cord and ends up at each segment of the spinal cord in the posterior horns where all sensory information from the peripheral receptors for the first time enters the CNS and where these signals are initially processed. Let’s imagine a patient or client, who is in acute or chronic pain, enters the clinic for the first time. At that vulnerable time for the patient his or her brain will see even simple examination of the soft tissues (e.g., therapist applies mild pressure to detect presence of active trigger points) as a new nociception which additionally stimulates the already over-sensitized cortex and it will immediately trigger the Nocebo Effect. The patient can’t consciously control it. As a result, with all positive intentions the therapist, without even realizing it, now faces an uphill psycho-somatic battle since for a couple sessions he or she instead of building clinical response is forced to overcome the protective reaction of the brain. If, the CCT was activated in the patient’s brain before the therapist starts the therapy or even palpatory evaluation, inhibitory commands from the thalamus will descend along the posterior columns to the segments of the spinal cord, where acute or chronic nociception enters the CNS and it allows the CCT to partially close so-called sensory ‘gates’. As a result, less sensory nociceptive information will reach the cortex, desensitizing it and adapting the brain for further therapy. Thus, the practitioner should spend extra effort to build a healthy PE first before therapy starts. Fig. 1 illustrates descending control of CCT. Activation of PE starts from the very first moment the patient enters the clinic. We think it is correct to separate two scenarios: the clinic practices preventive, full body massage therapy or it practices clinical massage. In the latter case it is less important to create a relaxing atmosphere: candle, waterfall, soft music etc., but it is more essential that the patient from the very beginning feels that he or she is in the right place with the ‘light at the end of the tunnel’ clearly visible. In other words, the clinic and therapist must project the sense that this clinic IS the place where patients’ pathological symptoms will be correctly addressed. It starts with obvious things. Be sure to explain what you do and what training you’ve had in a brochure or wall poster and on your website. Create a review book (better even with pictures) where patients have left positive comments about your therapy and place it in the waiting room, put copies of all your diplomas and CEU certificates, etc. on the walls. Place charts (dermatomes, trigger points, skeleton, etc.) on the walls of the therapy room. By doing all this the therapist introduces him or herself to the patient’s brain in a positive and professional way, even before the first meeting. The next critical step is an Evaluation Session. We strongly believe that MTs MUST consider the psychological impact of their therapy and a correctly conducted Evaluation Session besides giving the therapist clinical data he or she needs, acts as a first crucial component in triggering PE. The Evaluation Session should include: Visual Evaluation, Clinical Interview, Palpatory Evaluation and other necessary testing. We highly suggest therapists read several important articles published in JMS on these subjects. They will greatly update your evaluation skills. During first evaluation session each move or word is immediately registered and analyzed by the patient and what and how therapist do it can or can’t contribute to the generation of PE. The skillful therapist starts to build up healthy PE with first glimpse on the patient and first ‘Hello”. Visual evaluation starts from the first interaction with the patient. It can be split into two components. 1. Visual evaluation the therapist conducts from the moment of first interaction with patient or client when he or she is completely unaware that your evaluation process is already started. For example, the therapist may observe through the window how the patient walks on the street before he enters the clinic. From clinical perspective this is the most valuable part of the Visual Evaluation because the patient/client is not aware of it and acts without hiding or overexaggerating symptoms. 2. The second part contributes more to the PE activation. During this part the therapist intentionally makes efforts to make the process of gathering the visual evaluation data as visible as possible for the patient. Don’t forget that the patient’s brain watches your every move! For example, the therapist visually examines the patient with right side headache. Even a brief look at the patient indicates the patient’s right shoulder is elevated, the upper lid of his right eye is lower, etc. However, don’t rush! Face the patient and with a concentrating glaze slowly move your eyes from right to left, intentionally prolonging comparison of both sides. Visual Evaluation logically flows into the Clinical Interview which is the most important part of the Evaluation Session from the perspective of the PE. The Clinical Interview must be arranged and conducted in a special way to extract from the patient as much as possible helpful clinical information while building trust and confidence in the patient. The Clinical Interview also serves as an introduction to the final parts of evaluation: palpation and testing. Without a correctly conducted Interview the brain will initially see palpation as an intrusion and the patient is unable to control this. We highly suggest readers study the “Science of The Clinical Interview” article we mentioned above. It teaches therapists step by step how to conduct this part of the evaluation correctly. All palpation and testing techniques must be done with carefully measured pressure, gradually and in defensive mode. For example, the patient complains about right side acute lower back pain and the therapist would like to examine the degree of tension and presence of active trigger points in his right lumbar erectors. The correct way of palpation is to start with application of moderate pressure on the left side middle back paravertebral muscles, then move gradually down to the left lower back paravertebrals and only after that start the examination of right side paravertebrals. In such case the therapist kills two birds with one shot. First, he or she observes and compares the reaction of the patient to similar pressure in the unaffected and affected areas. Secondly, the gradual approach to the palpation of the area where the patient feels pain and discomfort allows activation of CCT and it diminishes the negative impact of the Nocebo Effect. Another example is the examination of ROM. When asking the patient to show the movement which triggers pain and discomfort ask the patient to stop movement as soon as he or she reaches the pain threshold. At the end of the Evaluation Session the therapist has accumulated enough clinical data to make the necessary decisions regarding the future therapy. However, this moment, i.e., AFTER the entire evaluation is finished is the ideal time to trigger the PE. At this point all information the therapist has accumulated so far, starting for example from the patient’s gait or type of his or her handshake, the history of illness, to the symptoms found during palpatory evaluation and testing must be transmitted to the patient with proper explanations and how these data are correlated with his or her symptoms and how it will be used during future treatment. Use charts on the walls to explain your logic, try to link as much as possible what the patient felt with what you found, explain everything, use medical terms if you can, but explain their meaning. By doing that you are actively involving patients in the treatment process and creating a partnership with the patients in fighting the abnormality they suffer. These behavioral adjustments greatly contribute to the formation and support of PE. If the therapist can’t project confidence and knowledge in what he or she is doing, can’t fully answer the patient’s questions and doubts, the therapist has lost the entire Evaluation and there is no way PE can be triggered at this point. In such case even before therapy starts the treatment now becomes an uphill battle. As we discussed in Part I of this article, the PE is the result of electrical activity generated in the prefrontal cortex and it also relies heavily on the activity of the limbic system which is responsible for our behavior, motivations and emotions. A correctly conducted Evaluation Session activates the Central Control Trigger before actual therapy starts and it also activates the brain’s self-regulatory mechanisms, making the patient’s CNS better respond to the application of clinical modalities the therapist will use. While treatment progresses, and it has a positive dynamic, it further contributes and enhances the PE by altering cortical activity through the repetitive activation of peripheral receptors located in the soft tissues. Massage therapy, besides directly addressing soft tissue abnormalities, generates and constantly alters the sensory flow which slowly starts to re-arrange CNS function by desensitizing spinal (to prevent entrance of sensory stimuli into CNS) and cortical centers (decrease electrical activity and prevent formation of pain sensation). Thus, the therapist uses peripheral receptors in the soft tissue to alter CNS function and continue to support the PE. There is another important aspect worth mentioning here. If, the clinic works with physicians (PCPs, neurologists, orthopedists, etc.) it also becomes an important component in triggering the PE. If, MT is suggested by the physician, the patient’s mind from the beginning considers it as important medical procedure. Therefore, building healthy professional relations with the local medical community is so important from the referral perspective, but also from the perspective of future PE. Information in the previous part of this article is the common way all health practitioners are trained to interact with new patients and we just adjusted this data to massage therapists. Since therapists are addressing the body’s malfunctions the same rules should be applied. In the two following sections we will use some scientific data and express our own opinions. Since we share 35+ years of clinical experience of practicing and teaching Medical Massage, we think that we have the right to express some personal views on the subject. Generally speaking, touch is the most fundamental and primal sensory stimulation. In our earliest stages of mental development, we rely on touch more than any other sensory stimuli. In the first several months of our lives we learn about the surrounding world using mostly touch until our brain is able to process and use data obtained from more complex sensory organs (vision, hearing, etc.). Also, blind people who live rich and productive lives show us the true capabilities and importance of touch. However, touch is not only comforting and informative to our brains. It also must be used as a clinical tool of great importance and effectiveness. We think we all agree that when we touch our patients/clients we start a chain of events in their bodies which have local and distant healing impacts on the tissues, organs and entire nervous system. Thus, during the treatment we generate energy (e.g., piezoelectricity, streaming potentials, axon reflexes, etc.) in the patient’s body to promote recovery. As humans our minds are constantly thinking, envisioning, imagining, and projecting and these processes are results of electrical activities in our brains. These electrical activities can be observed and measured from outside of our bodies for example, by Electroencephalography. Fig. 2 illustrates EEG of the brain recorded at rest with subject opening and closing his eyes. As you can see, even such a simple thing as opening eyes is able to greatly spike electric activity in the brain and it is registered by electrodes which are located outside of the brain and skull. The fact that brain activity can be registered and measured by outside placed devices indicates that our brain as well as normal functioning of the entire body, creates and emits a bioelectric field around us. The quality and power of our personal bioelectric field varies from us being healthy or being sick or injured, from our age, type of everyday activity, emotions etc. From this perspective let’s look at electrical functioning of healthy and affected bodies and interactions of the therapist with the patient. We now know that MRI can register and observe changes in the brain’s activity associated with acute and chronic pain and it showed that normal electric activity generated by the brain is profoundly changed in cases of chronic somatic or visceral abnormalities. Fig. 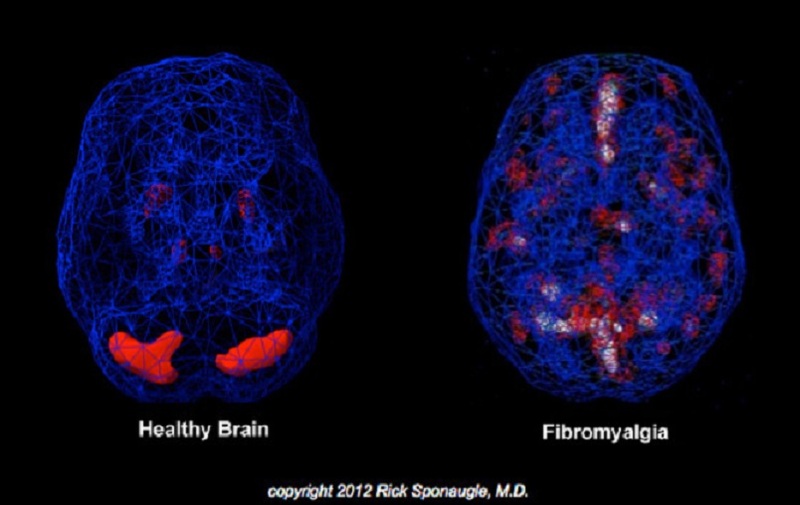 3 illustrates what parts of the brain are lit up at rest in a healthy subject and how much changes in the electrical activity of the brain registered in the patient with Fibromyalgia, which is an excellent clinical example of long lasting chronic pain (Sponaugle, 2012). This picture is an example of central events triggered in the brain itself during and after its bombardment by low grade nociception from peripheral receptors located in the affected soft tissues. It is a well-documented fact that MT has a profound impact on the function of the CNS, from altering activity of the autonomic nervous system to helping patients with insomnia or debilitating psychiatric disorders (Barr and Taslitz, 1970; Weinberg et al, 1988; Dossetor, et al., 1991; Posadzki et al., 2011). Even this short review proves that the normal functioning of our body besides being electrically controlled, emits a so-called bio-electrical field. It consists from central (brain electric activity) and peripheral (conductance of nervous impulses, streaming potentials, heart contractions, and pulsation of major arteries, etc.) components. Thus, each of us has such a field and its magnitude changes during our lifetime because of aging, pathology or types of activity we are exposed to. There are no doubts that normal distribution of electrical charge and consequently normal body functions are altered in the patient with pain and dysfunction, especially in chronic cases. Thus, restoration of normal electrical activity in the tissues and organs becomes a critical component of somatic rehabilitation by means of MT. Besides activation of the PE before treatment starts the skillful therapist uses a large variety of clinical tools to restore the normal bioelectricity in the soft tissues by using variety of clinical tools, from application of friction under the specific angle of 45 degrees to trigger larger piezoelectrical events to resetting muscle spindle receptors using Muscle Energy Techniques. The therapist’s everyday activities including his or her work, also are the result of electrical events. Thus, a healthy therapist while working with the patient also emits bioelectrical potentials. Their magnitude and quantity will increase if the therapist is constantly engaged in the treatment process. We believe the therapist, who for example, performs the same full body massage routines from day to day frequently becomes disengaged and while working he or she starts to think about other things, like what to have for dinner. In these cases, therapy itself elicits a less healing bioelectrical field compared to the Medical Massage therapist who constantly analyzes changes in tissue structure, monitors the patient’s body response, adjusts or alters massage techniques, observes the patient’s breathing and response to the pressure, etc. Thus, while working on the patient the therapist makes intellectual efforts to follow the anatomy of the area, understand the pathological events that happened there and constantly analyze and adjust the treatment process. There is no doubt that practicing clinical aspects of MT stimulates the therapist’s mind and makes work more exciting. However, to do that the therapist’s brain must also emit and enhance bioelectrical potentials and their presence may be registered by the patient and it increases the healing power of MT. We would highly recommend that therapists start to train and enhance personal bioelectrical field. Pull out an anatomical chart, textbook or play videos associated with the patient you are currently working on. As you read or watch the materials, try to see in your mind’s eye layers of the soft tissues in the affected area and their interactions. Imagine you work in these areas and in your mind’s eye clearly arrange it step by step. You will see how much easier your work will be when you start actual therapy and the patient will immediately feel it because he or she will feel your confidence. Such preparation has another very important benefit. Since the flow of the therapy was previously established in your head, you are now freed in your mind and can concentrate on the small changes body and tissue will produce as a result of your therapy. It will also give you better control of the treatment process if after the therapy you mentioned to the patient what you observed and plan to do next. It greatly enhances the PE. There is another aspect we would like to mention here. We believe that every therapist has had the experience of working on the client/patient which made the therapist uncomfortable in some strange and unexplainable ways. It is almost a gut feeling that this is a wrong patient/client relationship and after the treatment is done the therapist felt drained emotionally and physically. In these cases, the patient or client generated a bioelectrical field and it interfered and affected the therapist’s body normal bioelectric activity. Therefore, it is so important to trigger PE before treatment starts. In such case you as the therapist deliver therapeutic impact while also protecting yourself from emotional and mental drainage elicited by some patients who suffer from sometimes years of chronic pain. Thus, MT triggers local and central changes in the body’s bioelectrical activities and at the same time it activates our patients’ brain self-regulatory mechanisms. Natural forces within us are the true healers of disease. Electrical activities occur in our bodies 24/7. All organs and systems communicate with the central nervous system as well as with each other through electrical impulses and biochemical reactions. The constant movement of electrical charges in our body induces the bioelectric field around us. The task of a massage therapist is to adjust and correctly channel this energy towards healing and self-healing. In an analogy, we see the MT as the electrical engineer who changes fuses, restores electricity conductance and stimulates electric potentials to enhance current flow. All of that can be done with correctly designed touch therapy by working with soft tissues locally, playing and altering activity of peripheral receptors, and eventually CNS. However, if therapists underestimate the importance of addressing the patient’s brain even before therapy starts he or she loses critically important and powerful ally of entire treatment process. Barr, J .S., Taslitz, N.: The Inﬂuence of Back Massage on Autonomic Functions. Phys. Ther., 50(12):1679-1691, 1970. Basset, C.A.L. : Biophysical Principles Affecting Bone Structure. In: The Biochemistry and Phisiology of Bone. Vol. III. Edited by G.H. Botnne. “Academic Press”, New York, 1971. Becker, R.0., Selden, G.: The Body Electric. “William Morrow & Co, Inc”. New York, 1985. Dossetor, D.R., Couryer, S., Nicol, A.R. : Massage for Very Severe Self-Injurious Behavior in a Girl with Comelia de Lange Syndrome. Dev. Med. Child. Neurol., 33: 636-644, 1991. Melzack, R. (2001) Pain and the Neuromatrix in the Brain. J. Dental Ed., 65:1378-1382. Weinberg, R., Jackson, A., Kolodny, K.: The Relationship of Massage and Exercise to Mood Enhancement. Sports Psychologists, 2: 202-211, 1988.